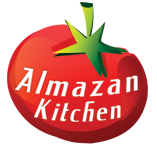 The best worldwide dish called “Pilaf” made in AlmazanKitchen’s style! No one can really say who the first to invent this dish was. There’re a lot of varieties of it depending on the location, and single one of it is awesome! Today we’re proud to share our recipe with you! Fresh organic turkey leg, rice, 3 different carrots, tomatoes and onions, a LOT of pepper and special simple spice mix! Slice the onion into half rounds. Slice 3 different carrots into rounds. Dice 700g of turkey leg. Preheat the pan, melt 3 tbsp. of butter. Add 1 cup of rice into the pan with melted butter. Fry until rice soaks the butter. Do not forget to stir. Preheat the clayware low casserole, grease with oil. Toss in diced turkey leg. Salt and pepper well. We mean a LOT of pepper! Fry the turkey until golden brown from each side. Do not forget to stir. Add ½ tbsp. of cinnamon and ½ of paprika. Transfer everything from the pan to low casserole. Spread evenly on the surface. Cover with lid and slow cook for 30-40 min. Remove the lid, cover low casserole with round wooden plate. Flip the casserole so the meat is on top.